I’ve decided to write a series of articles about the MyStarbucksRewards program. As a reminder, any registered Starbucks card can earn rewards under the MyStarbucksRewards program. In the U.S., it is estimated that about 25% of all transactions are with a registered card, and that there are more than four million active card holders. And in the past year, about 20 million transactions were with the mobile card phone application. That’s a lot of Starbucks cards in use! Given the massive numbers of customers using a registered card (or a registered card on their mobile device with the Starbucks app), understanding these rewards is more important now than ever before. And, there’s no doubt that Starbucks gains a lot of brand loyalty by having so many people carrying around their cards. Here is how a customer reaches the “Green Level” of card rewards: When you register a card, put money on it, and use it to pay for your purchases at least five times, you’ll automatically be elevated to the “Green Level” of card rewards. The information I give will not exactly match what is on the Starbucks website. The benefits announced on that page do not completely correspond to the all the benefits stated by moderators on MSI, or Starbucks Customer Service, and they don’t entirely match what the registers do. Nor do the benefits on the website exactly match what I see happening inside the stores. And of course, these four articles only pertain to the United States version of the My Starbucks Rewards. There are international markets with very different rewards programs. I had made attempts (a while ago) to get someone in the Rewards/loyalty department to sit down with me, but that has never worked out, so I’ll just write my articles, and hope that my understanding of them is close to the intent of the rewards. One thing for sure, the sauces are not included in this perk. Mocha sauce, pumpkin spice sauce, chai sauce, and white mocha sauce are never discounted as free. If a customer orders a tall latte with just “one pump of mocha” there is still a charge for that mocha sauce. If you think about it, if there were no charges for “mocha” sauce, many drinks would only be charged as a latte. I don’t think Starbucks ever intended to create a program where most everyone ordering an espresso bar beverage would be charged as just a “latte,” with no mocha or white mocha charges, or other specialty drink charges. Also, the sauces are a little thicker, and a little more costly than the syrups. The syrups really are mostly a sugar and water, and so they’re fairly cheap with high margin to them. The baristas do some preparation to make some of the sauces in the store (such as mocha sauce), so there is the cost of additional labor with the sauces. When a customer is adding syrup flavors to his or her beverage, the surcharge for that is deducted after the card is swiped. In other words, if I were to order a tall iced vanilla chai, the registers would waive the charge for the vanilla syrup as a registered card benefit at the “Green” level of benefit or higher. All the standard syrups such as vanilla, sugar free vanilla, toffeenut, caramel, sugar free caramel, peppermint, cinnamon dulce, hazelnut, raspberry, and classic are free of charge at the Green level. If you want your beverage with soy milk instead of dairy milk, there is no surcharge for soy milk when you pay for your beverage using a registered Starbucks card at the Green Level of benefits. This benefit is clear and unambiguous. By the way, when the barista rings up the beverage, the soy milk charge will show as included in the total. It doesn’t come off until the card is swiped. (That is true for all the card benefits, you’ll see the charge until the card is swiped.) The fee for the soy milk will be automatically deducted, and the register barista has no control over this. There is no special code that the register barista needs to input. This is probably one of the most unambiguous and clear benefits of a card at the “Green” level of benefits. I have always thought that it makes sense to charge at least a nominal fee for using soy milk in a beverage. At least in my area, it costs more to buy the alternative milks in the grocery store than just to buy ordinary cow’s milk. If you want your beverage with breve milk instead of a different milk option, the surcharge for this milk change is waived when you pay for your beverage using a registered Starbucks card at the Green Level of benefits. When the current Rewards program launched (officially December 26, 2009), it was crystal clear that breve would be no charge with a registered card at the Green level or higher. The registers definitely still make this deduction. 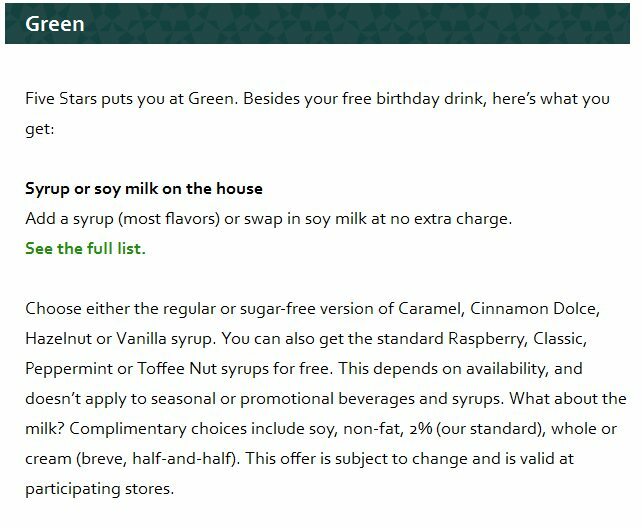 What’s very strange is that I am sure that for a while the MyStarbucksRewards page didn’t mention this perk. In any case, the free breve perk is now listed there. I am sure it wasn’t there a couple of months ago, and I wish I’d taken a screen shot of it. I’d mentioned it to a number of partners. Somehow, it’s fixed now. You have to click on “see full list” to find a mention of it, and the header could still be made more clear. Here’s the start of the series of articles. Looking forward to your comments. Would you change this MyStarbucksRewards benefit in any way? Do you have a different understanding of these benefits? I’ll be looking forward to all your thoughts and insights as this blog shines a spotlight on the My Starbucks Rewards program. The Starbucks mistake mug: The extremely rare Seattle mug with a misspelling. There's a wedding at the Westlake Center Starbucks! GOLD NEWS: My Starbucks Rewards adds more perks; Cards are shiny & new! the card can be registerd. Great series of articles Melody. Looking forward the rest of them. Re free soy milk. I have seen many customers not get this free reward and there seems to still be confusion re this. It would be so nice if someone from SB rewards dept sits down with you. Thenks for breaking this down. I have a question: if I order a coffee with a “topper” is that free? For example, is a tall bold with a soy topper charged just as a tall coffee? I think this is a very helpful thing to do…this series of MSR faqs. I agree that I think SOY is a fairly ‘big’? reward….it is expensive. I’d like to see one extra shot as part of the rewards….. I don’t think that’s a costly thing for Sbux (no matter what they charge) and I use it all the time…most of the other rewards don’t affect the drinks I get. I do get the cinnamon dolce syrup, in winter (if we EVER have cold weather again) but my extra shots far outweigh the syrup. Well, that’s my wish list I guess. Also wish they’d keep coconut all yr….I don’t even know…is that included or is it being treated like the dark cherry, which I also wish they’d bring back, reward or not. @CD: good question. I can’t see how it could not be treated as a tall coffee, if the soy is coming off anyway…but I don’t know. I think this series will generate a lot of conversation. In my experience the syrup vs sauce issue is very confusing for customers. Caramel Drizzle is also a sauce which isn’t free with the MSR program. However since almost everyone asks for it at the handoff plane rather than at the register they aren’t paying for it anyway because of our ‘just say yes’ policy. @CD if you are just pouring a bit of soy into your coffee it should be free, even without a registered card. Thank you for the information. I am looking forward to the upcoming articles. For me, the “hardest” part of the rewards is that they seem to be understood differently at different Starbucks. Thank you, Melody! I get so many people complaining about our store charging for “dirty lattes” when apparently no other store in town charges for that one pump of mocha the way they should be. Grr. @Jenni – All I know is that if I were a partner, I’d be charging for everything every single time: It’s your labor, your inventory, and your profitability. Heck, I’d be hitting the grinding button on whole bean too (no charge, but labor). @Cd & Jenni – I completely forgot about the issue of a soy topper. I’ve always understood it to be up to 2 ounces of cold soy or condiment. I remember that it used to be so extremely common that Starbucks sold 14 ounce “tall” cups and 18 ounce “grande” re-usable mugs and tumblers – The idea was that 2 ounces of cold milk is totally normal. I see people use 14 ounce “tall” tumblers and mugs – There are still a lot of them out there – and there was indeed a ceramic one sold just last year, and I bet those sizes confuse some partners. But all I’m trying to say is that I had always thought 2 ounces was the standard for a cold milk condiment. Sorry to use a lot of words to say that! I agree SBUX has over-complicated this with their caveats like no cinnamon dolce (they offer it now though, right?) or other syrups like dark cherry. Keep it simple, a syrup is a syrup. Don’t make the baristas have to make things up like “it’s premium and costs more to make” because that only waters down the experience by creating lots of inconsistencies. @denise – I would love to see a free shot. The only perk I ever use is the free tall with purchase of a pound. I don’t even use the postcards as the expiration dates and inconvenience are not worth it. A free shot? THAT would be a reward! Thanks for the answers on the soy topper! Did it say anywhere that cinnamon dolce syrup is going? as a reward? I’d then be reallllly not too happy. Looking forward to reading this series. Free refills while you stay in the store on some beverages is another reward at the green level. i think knowing how to ‘redeem’ is the most difficult obstacle for new customers to learn. I also just met a partner who didn’t seem open to learning about this, even tho the register told her so. Nice job explaining the freebies, Melody! I, too, wish Starbucks would offer a free shot on lattes or cappuccinos. @denise. No c dolce is still a syrup – not going. But when the rewards first came out it was not included. @CD: thanx for your response to my cinnamon dolce question! btw, (and I’m guessing you know this), all the Sbux that I’ve been to say they pay no attention to the exp. dates on those ‘sweet15’ cards….so I hope that’s not stopping you from using them. In Canada, the free milk also includes Lactaid milk (lactose free milk). Licensed stores do not have a way of having the register automatically deduct the free syrup so either the customer lets us know it’s a registered card or we have to first do an inquiry on the card. As someone else said, the syrup vs. sauce issue comes up a lot and customers don’t understand the difference. Perhaps the advertising could be a bit more clear? @CD -I wanted to add that we do not usually check the expiry dates on the postcards and I would not turn one away…. Thanks @Becca and @denise. I gave a stack to my daughter and will let her know. My “fanciest” drink is a double tall or short cappuccino or a doppio con panna so those cards are better suited to someone like her who drink the bigger/fancier drinks. What does the sf stand for in your drink? Just wondering, if i ordered that drink with soy milk, would the soy milk be free also? @Ela: sf = sugar free, for the syrup. and yes, you should get the syrup and the soy as rewards. @denise r is right, it stands for sugar free and yes also that the soy will be included. It would be a free charge for the soy, the add milk for the misto and the syrup. If you want soymilk added to something wherer it needs to be heated or steamed (e.g., misto or latte), then it is considered an extra charge and, therefore, will come free at the green level. If, however, you simply want to splash some into your iced coffee and ask for “soy on the bar,” it is not always considered an extra charge. Are any of the syrups good in any type of drink? I liked their Cinnamon Dolce Latte, but was wondering if a shot of that syrup in regular brewed coffee is any good? Does that even make sense? I’m sure this is probably a dumb question, but since I’m more of a frappuccino person, I figure I’d ask anyway. @Jessica in case you haven’t tried it yet, I recommend the cinnamon dolce creme frap. It tastes like you’re drinking a cinnamon bun! Hi Henna! Thank you for finding my blog. You can see by the date on this article, it’s an old one. A lot of the info in this article is no longer relevant. 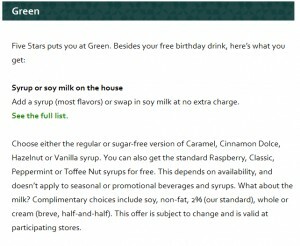 In October last year, the U.S. MyStarbucksRewards went through major changes, and there no longer is any kind of perk of free syrups and free soy milk. I usually stay in the store and get refills but when I go to get my iced black tea latte refilled, I always order it with soy, but the barista tells me that soy isn’t covered with the refills. I’m at green status, so I’m confused. Is this supposed to happen? @Jessica Shaw – There is no latte refill, just brewed or iced coffee or tea refills (regardless of your original beverage purchase). So, the partners (baristas) you’ve been dealing with either don’t understand the refill policy, or are being generous to you. It is definitely a confusing topic for both customers and partners. Soy should still be an extra charge for any drink, regardless of whether you are a welcome, green, gold card, or non-member. The previous rewards program did include free soy, but not any more. You can refer to starbucks.com/rewards, or click on the FAQ page there for the latest info. Hope that helps.